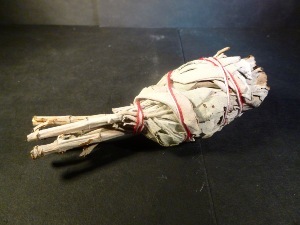 CALIFORNIAN WHITE SAGE SMUDGE STICK, Smudging, is a ritual to aid you in clearing and balancing of energies. By burning the smudge sticks the essence of herbs are released in the smoke. This, coupled with your intention, promotes a clearing & balancing of energies. Make sure you carry a dish (small saucer, bowl or shell filled with sand) under the smudge stick while you are walking around to catch any falling embers. SMUDGING, First start by opening all windows, cover any food present and light a candle. Light the smudge stick and once the smudge stick is burning, extinguish the flame and the glowing embers will produce smoke. Keep the embers going by blowing gently or exhaling on them. Free yourself of any negative thoughts before beginning smudging. Clearly state your intentions e.g. the release of all negative energies out into the universe while asking for love, abundance, harmony and health to enter this space. Wash the smoke up towards your heart, up over your head and then down towards your feet to ground the energy and yourself. 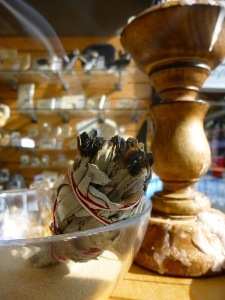 Carry the smouldering smudge stick around the are you wish to cleanse, visualising the change. Keep repeating your personal intentions as you fan the smoke into the air. A feather or your cupped hand can be used to fan the smoke around, this will also keep the embers glowing. On finishing, press the smudge stick into sand or dirt, to extinguish the smudge stick, do not use water for this is disrespectful to the fire spirits. Keep your smudge stick in a bowl or plate in a sacred space for future use.